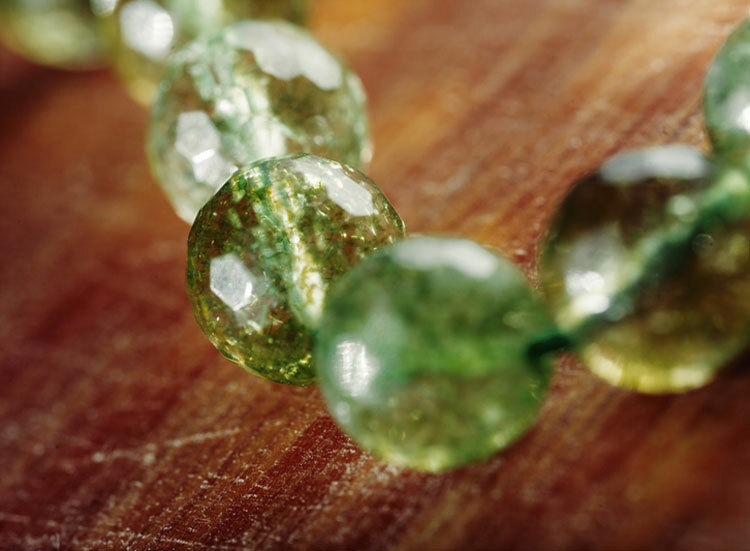 Even though more and more people are adopting holistic practices like acupuncture and drinking green tea these days, Westerners tend to be a bit skeptical of ancient medicinal practices — especially when it comes to healing crystals and gemstones. But the use of gems and crystals has a long, rich history. 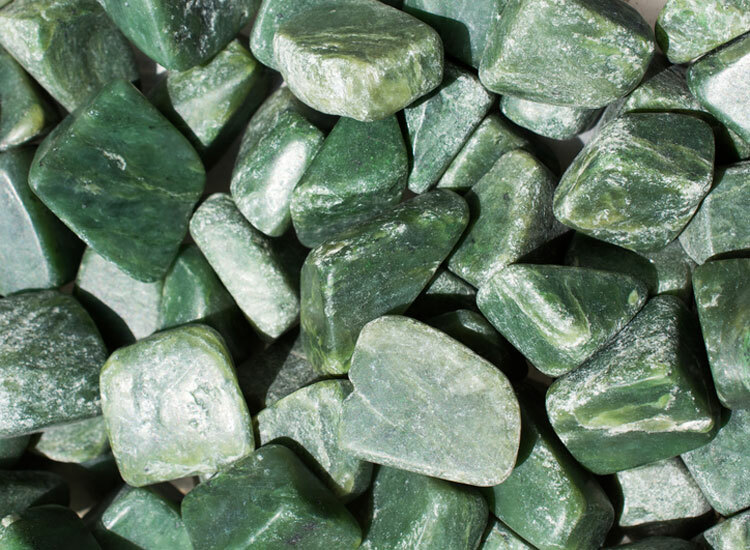 And one of the most popular gems used in the practice of gemstone and crystal healing is green jade. Ancient artifacts and deity masks were made from jade rock in Central America, New Zealand, Mexico and South America. In China, jade has been used extensively, prized for its beautiful emerald green color, carved into beads, burial artifacts, incense burners, gems, musical instruments vessels and pendants. The history of jade and its uses is fascinating, but what intrigues me the most about this stone is its healing properties. In this article, I’ll share a bit about the history and meaning of jade. But more importantly, I’m going to tell you about the ways this incredible little stone can help ease your pain — in just minutes. Jade is a semi-precious stone prized for its purported metaphysical and healing properties for more than 6,000 years. It has been called the ultimate “dream stone,” believed to be infused with divine energy which enables it to bless everything it touches. In ancient lore, cultures from the ancient Chinese to the Aztecs prized jade even more than gold for its beauty. The Chinese revered jade for its ability to bring about overall well-being, emotional healing, good luck and good fortune, and prosperity and abundance. They also believed keeping jade was connected to living a long life. Ancient shamans also believed jade could treat kidney and adrenal gland disorders. These beliefs have carried into modern times. Many people today believe that jade is a protective stone that can ward off negative energies and negative thoughts. That it stabilizes the personality, and promotes self-reliance and self-sufficiency. It’s one of the reasons jade jewelry is still so popular today. While jade comes in many colors — there’s black jade, white jade, yellow jade, lavender jade, red jade and blue jade — it is the green jade that has historically been the most popular. Key takeaway: Jade has been revered for its metaphysical properties by cultures around the world for thousands of years. Jade is prized by modern practitioners of crystal healing not only for its supposed metaphysical properties, but also for the effects that it has on the physical body. It’s also been said that jade has a healing and calming effect on the nervous system. That it can soothe the kidneys, gallbladder and liver. There are even claims that it can benefit the renal system and help get rid of kidney stones. If you’re thinking this all sounds like New-Age hooey, I understand your skepticism. While I think there’s a lot to be said for the healing properties of things found in nature — especially something that’s been used for as long as jade has — I’m someone who needs PROOF. I need to see real results. I’ll cover the powerful pain-relieving, healing power of jade more in the next section, but you can also learn more by clicking right here. Key takeaway: Many cultures, as well as current practitioners of crystal healing, believe that jade has an effect on overall health and well-being. There is one property of jade that has been clinically tested and proven to benefit your health in an enormous way. Put to use, it could forever change the way you treat your pain. It turns out that jade has an unmatched ability to conduct far infrared heat. You’ve probably heard of far-infrared heat (FIR) before. Or maybe you’ve heard of far-infrared cameras and photography. Far infrared has a longer wave than infrared. The waves can’t be seen — only experienced as heat. This type of wave is responsible for the deep-penetrating heat you soak up when you lay out in the sun, but without the harmful UV rays. Far infrared heat is isolated and has no dangerous effects whatsoever. It turns out, jade and far infrared heat get along extremely well. Jade stones absorb the FIR waves and distribute them evenly and continuously better than almost any other material in the world. Basically any of the body pain you’d normally take painkillers or get massage therapy for. But how can a normal person like you and me benefit from the combined healing power or jade and far-infrared heat? Actually, it’s not complicated at all. All it requires is a specialized far-infrared heating pad. A far-infrared heating pad that incorporates jade stones is like no other heating pad in the world. The pain relief it provides lasts for hours, not just a few minutes. When the special FIR heat passes through the jade stones, it allows the heat to penetrate deeper than a traditional heating pad, getting deep into your muscles, joints and organs. It increases your blood circulation–which leads directly to pain relief and healing–in 30 minutes or less. The incredible healing benefits of far-infrared heat therapy was first discovered by NASA — and it was kept under wraps for decades. After years of this technology being reserved for astronauts, it’s now finally available for people like you and me. To learn more about how to harness the power of jade and infrared heat — and to read all the incredible scientific research that PROVES its effectiveness at treating pain quickly — just click right here. Key takeaway: Jade is one of the world’s best conductors of far infrared heat; this combination is scientifically proven to reduce pain. 1. Jade is one of the most popular stones used in crystal healing. 2. Traditional healers have long touted the health benefits of jade. 3. When combined, far-infrared heat and jade stones deliver extraordinary pain relief because the heat penetrates deeper into the affected part of the body than infrared heat can. Havwe anIfrared heating pad, and of course jade stones.. Now how do wecombine both to get teh maximumelief from the body aches etc. listed in your article.. Place the jade on your body?? or on the infra red heating pad?? Must be sometning out there to accomoodate the actions.. I have an far infarred heating pad with the stones on them………………… I purchassed it on Amazon… I have used far infared plain heat pads now for 1 yr…. I am pleased to say that used proper… I sleep w/mine.never on bare skin ! and use it sometimes during the day……….I am excited to try the jade far inarred heat pad. 1. The pads are designed for you to use the stones facing towards the body, please though place a protective layer between you and the stones as they can get hot and second to keep the pad clean. 2. To get the best results you will have to use the pad according to the manufactures suggested use and try different temperatures and try different positions and try different use times and try different times of the day when using it. If I may ask,do you warm up the jade stones before you apply them to your body ? or do just place them on your body. I have purchased two of these from you to give as gifts, and they have been very appreciated. 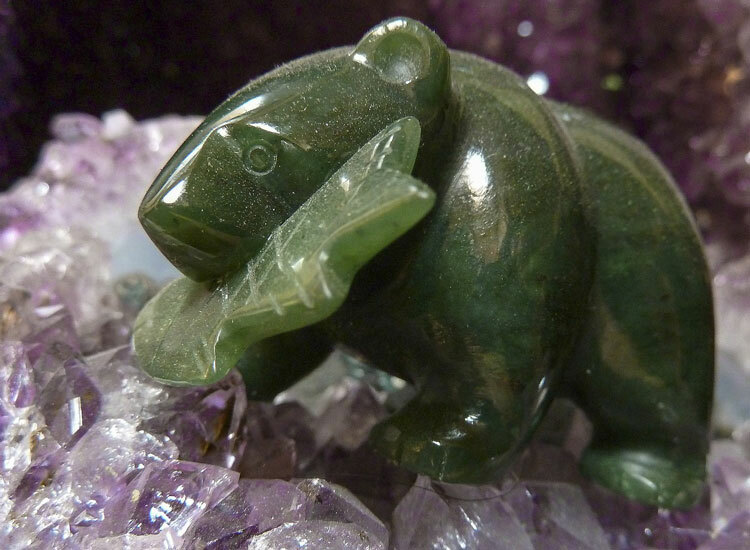 I would like to know, however, if you have any information on how the jade stones compare to the amethyst stones in biomats. Comparable, or each type has different attributes? I have used crystals for quite a while. Smoky quartz also works for hip pain. Love the jade crystals as well as many of the other crystals for various reasons. The energy emitted is phenomenal. Thank you for this article. Very interesting. I have extreme ELECTRO MAGNETIC SENSITIVITY. SINCE THE PAD IS RUN BY ELECTRICITY I WOULD THINK IT WOULD AFFECT ME ADVERSELY DUE TO THE EMS. PLEASE ADVISE. THANK YOU. I FIND THIS TO B VERY INTERESTING! I HAVE FOR YEARS NOW TRY & AVOID CHEMICAL DRUGS & DO HERBS INSTEAD ! BUT, I FELL DWN STAIRS AT WORK & I MESSED UP MY NECK…2 VERDIBRAES IN MY NECK ALONG W TEARS, & ALSO 2 VERDIBRAES IN UPPER BACK, I GET LOTS OF PAIN & ITS HARD TO SLEEP! I ALSO SHOVED MY SHOULDER FOREWARD SO MY SHOULDERBLADE IS PUSHED FOREWARD SO THE BACK BLADE IS STICKING OUT FAR ENOUGH TO GET 3 OF UR FINGERS TO THE FIRST KNUCKLES! CONSTENANTLY PUTTING PRESSURE ON MY SHOULDERS MUSCLES, RENDONS, ETC….SHARP PAIN! SOMETIMES WHEN I DO GET SOME SLEEP, I WAKE UP BECAUSE OF MY SHOULDER FEELING LIKE CREEPY CRAWLERS UNDER NIETH THE SHOULDER BLADE & I HAVE TO SHOVE THE SHOULDER W ME PULLING ARM AS FAR TO THE LEFT AS POSSIBLE….SO I CAN PARTLY REACH THE MUDCLE!! DRIVES ME NUTS !!! I MIGHT NEED SURGERY TO CORRECT! I AM ON PAIN PILLS JUST TO GET SOME PEACEFUL SLEEP, BUT, I HATE HAVING TO TAKE THEM ! I USE TO B A CORRECTIONAL OFFICER & PRIDE MYSELF ON BN IN GREAT SHAPE BHY WORKING OUT W LIGHT WEIGHTS! BUT, NOW, IVE PUT ON ALMOST 50 LBS. DUE TO THYIS FALL! IM HOPEN FOR SOME RELIEF VERY SOON! HOPEN !! Thank you for your comment. 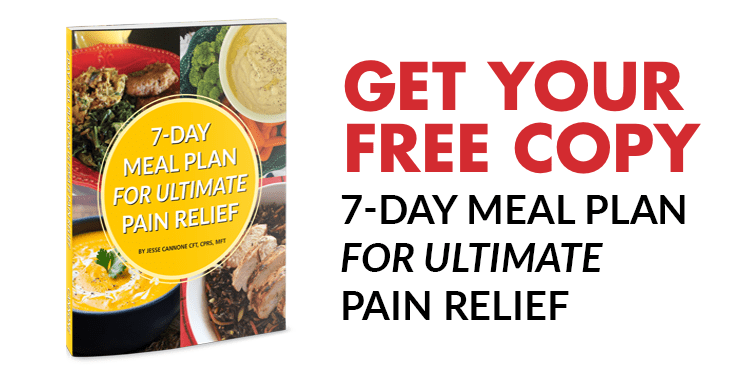 Please do get yourself a copy of our free back pain book The 7 Day Back Pain Cure. It has a lot of information to help you regarding the back, treatment options and pain relief plus many other useful aspects for you to read and consider. It will be a good starting point for you to educate and consider. We do hope you find it helpful. I would suggest going to an upper cervical Chiropractor. I spent YEARS going to a regular Chiropractor, but only finally got relief after seeing a NUCCA practitioner. A friend who lived across the country from me told me about them. She had fallen down her stairs and was in pain for YEARS until finally locating an upper cervical Chiropractor and receiving treatment from him. I thank God for my friend’s advice. I also use an infrared heating pad periodically and absolutely LOVE it!!! I had a torn meniscus repaired with arthroscopic surgery 15 years ago and am still PAINFREE to this day. Depends on where you have it done so if you decide to do it make sure you do your research first and go to the best in the business. I have an L5/S1 fusion with two titanium screws. Does that mean I cannot use the jade infrared heating pad, or is it possible to use it on low or keep it away from that area? How can I own this too ?? Thank You for explaining your situation and question. We feel our Arthritis Reversed Book will be helpful to you. Please take a look via this link for more information about it. My MRI showed I have stenosis. 3 surgeons appointments later I am told I am a risk for surgery. Having 4 bypasses 4 years ago I am diabetic and have kidney disease. What can a senior do in my situation. It pains my lower back and hip area when walking . I hardly go out and sit most times for relief which is not healthy. I have purchased two pads for myself and another to give as a gift. Fabulous investment!!!! Have severe tennis elbow in rt elbow….cant find a viable cure,relief for it!!??? Help..sos?? I love to see the western part of the world catch up with the eastern part of the world in healing!! I have lived the majority of my life in Asia. Because of that; I have had the privilege and opportunity to experience not only exposure to but to also practice many of these far less invasive methods. Western medicine and physicians (not all, but the majority) continue to go straight to providing pills and more pills so you can take the other pills, and using surgical procedures that could lead to other issues such as scar tissue, exasperate arthritis conditions and then there is the component of human error. 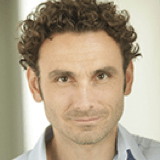 Even in European countries the first line of healing are natural, nature provided remedies. In America; with its use of chemicals, antibiotics; I’m not even sure if there is any untainted soil. Our medicine is making us more sick and dependent on big pharmaceutical companies. I say this with full awareness that there are many medical conditions such as cancer (a full variety of so many life taking cancers). But; I’m going to stick my neck out here….why? Have we altered so much of our planet and its environment that we are making ourselves sick? Just food for thought and motivated by personal experiences of a broken health care system in the U.S. I am, as you can tell, extremely frustrated and exhausted with the lack of cohesive and integrated care in this country. I’m sure it will be the death of me and many others. So, yes, I have worn a beautiful jade bracelet purchased in Japan years ago.